Our friends at Dogs on Deployment are the experts at finding foster homes for the pets of military members who are fulfilling service commitments. Dogs on Deployment has added a new initiative, Midas Cares, bringing awareness to the benefits of using service dogs to treat military members and veterans with post-traumatic stress (PTS), traumatic brain injuries, and military sexual trauma victims. Midas is the 2014 Dogs on Deployment mascot and military pet of the year. In May, we announced Midas was protected with Pets Best, and has accident and illness coverage with his pet insurance plan. The Midas Cares initiative was created by Sgt. Juan Valdez, who credits Midas with saving his life while coping with PTS, after serving four tours in Iraq as a Marine. With the help of Dogs on Deployment, Sgt. Valdez and Midas are able to fulfill their dreams and goals to improve the veteran service dog community. From helping veterans locate service dog programs in their area, to advocating for more holistic treatment and awareness for veterans everywhere, Midas Cares is a worthy cause. 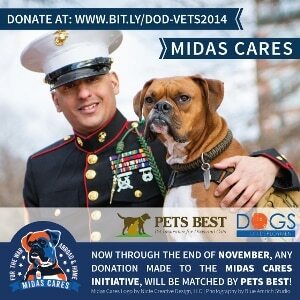 In honor of Veterans Day, Pets Best will match donations made to the Midas Cares initiative for the month of November. To make a donation, visit Dogs on Deployment and select ‘Support Midas Cares’ from the dropdown menu. Get a pet insurance quote from Pets Best and receive a 5% discount.